At Ormsgill Primary School, we believe that creativity is fundamental to the learning progression of all children. Art is a stimulant ulike any other. A high-quality art and design education should engage, inspire and challenge pupils. We aim to develop children’s knowledge and skills to experiment, invent and create their own art using a wide variety of mediums. Children are also taught to show awareness of different art forms from around the world as well as from the wealth of our nation. Our curriculum explores the work of well-known artists as well as Cumbrian-based artists such as John Duffin, Loki and Daniel Lee Cooper. · about the work of a range of artists, craftsmen and designers, describing the differences and similarities between different practices and disciplines, and making links to their own work. Pupils are taught to develop their techniques, including their control and their use of materials, with experimentation and an increasing awareness of different kinds of art, craft and design. · about the greatest artists, architects and designers in history. Art, craft and design demonstrates some of the highest forms of human creativity. A high quality art and design education should engage, inspire and challenge pupils. We aim to develop children’s knowledge and skills to experiment, invent and create their own art. Children are also taught to show awareness of different art forms from around the world as well as from the wealth of our nation. 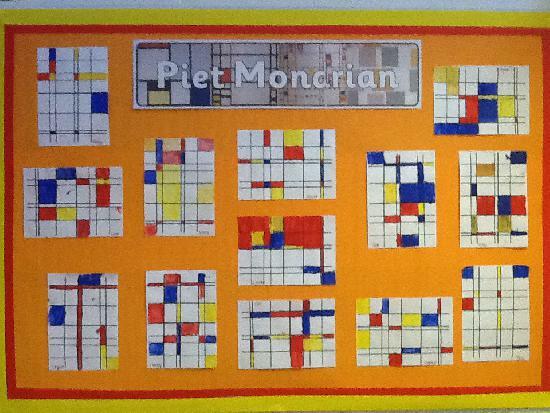 Our curriculum explores the work of well-known artists such as; Piet Mondrian, Andy Warhol, L S Lowry, Mark Rothko, Paul Klee and Jackson Pollock. about the work of a range of artists, craftsmen and designers, describing the differences and similarities between different practices and disciplines, and making links to their own work.